SMT-based program verifiers often suffer from the so-called butterfly effect, in which minor modifications to the program source cause significant instabilities in verification times, which in turn may lead to spurious verification failures and a degraded user experience. This paper identifies matching loops (ill-behaved quantifiers causing an SMT solver to repeatedly instantiate a small set of quantified formulas) as a significant contributor to these instabilities, and describes some techniques to detect and prevent them. At their core, the contributed techniques move the trigger selection logic away from the SMT solver and into the high-level verifier: this move allows authors of verifiers to annotate, rewrite, and analyze user-written quantifiers to improve the solver’s performance, using information that is easily available at the source level but would be hard to extract from the heavily encoded terms that the solver works with. 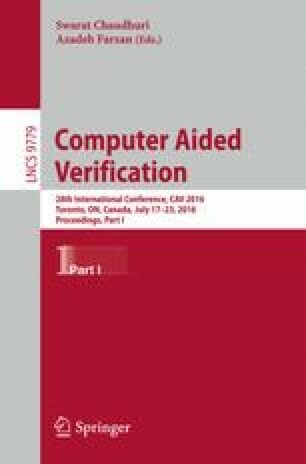 The paper demonstrates three core techniques (quantifier splitting, trigger sharing, and matching loop detection) by extending the Dafny verifier with its own trigger selection routine, and demonstrates significant predictability and performance gains on both Dafny’s test suite and large verification efforts using Dafny. * Authors are listed alphabetically. We are grateful to Chris Hawblitzel and Bryan Parno for productive discussions and feedback during the development of the auto-generated triggers and for help in setting up the IronFleets experiments, to Michał Moskal for his help in understanding how VCC generates triggers, and to Claire Dross and the anonymous reviewers for their comments on drafts of this paper. We also thank Andrew Reynolds for discussions about quantifiers and Dafny support in CVC4, Jay Lorch for his help testing the Dafny mode for Emacs, and Daan Leijen for typesetting assistance in Madoko. A special thanks goes to Jonathan Protzenko for connecting us authors and thus kickstarting this collaboration. This annex offers high-level pseudo-code for the main algorithm introduced in this paper; it simplifies the types of many of the relevant functions for clarity, and glosses over most performance optimizations discussed in the body of the paper.